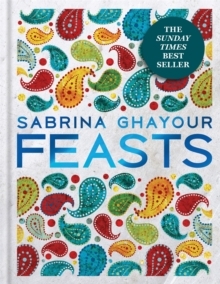 THE SUNDAY TIMES BESTSELLER 'Ghayour is responsible for making Persian food fashionable, and her new book does not disappoint. It is a joyous celebration of gathering friends and family around a table laden with abundance.' - Sunday Times Ireland 'Sabrina Ghayour knows how to throw a party: serve big dishes of beautifully spiced food and let everyone dig in.' - OLIVE 'Sabrina Ghayour's Middle-Eastern-plus food is all flavour, no fuss - and makes me very, very happy' - NIGELLA LAWSON In Feasts, the highly anticipated follow up to the award-winning Persiana & no. 1 bestseller Sirocco, Sabrina Ghayour presents a delicious array of Middle-Eastern dishes from breakfasts to banquets and the simple to the sumptuous. Enjoy menus and dozens of recipes for celebrations and occasions with family & friends, such as summer feasts, quick-fix feasts and brunch.